New construction behind imperial structures. Photo by @gandak423. It is a rare opportunity to see a country changing in time-lapse speed before your eyes. But that is exactly what a visit to Mongolia today offers. A country of 3 million people located between Russia and China, vast mining opportunities were discovered in Mongolia near the start of the 21st century, and by 2011, the nation had the fastest growing economy in the entire world. 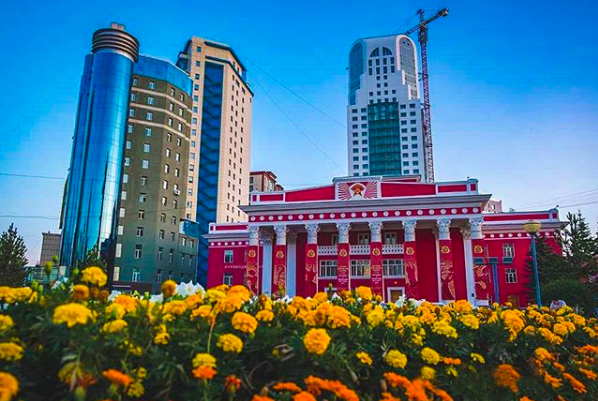 And although things have slowed since those heady days, the capital city of Ulaanbaatar—where 1.4 million of the country’s population lives—continues to push outwards and upwards. Mongolians who have been away even five years say they barely recognize parts of Ulaanbaatar upon their return. The city’s most deluxe accommodation, the 5-star Shangri-La Hotel, has been open less than four years. This is a country on the up-and-up. 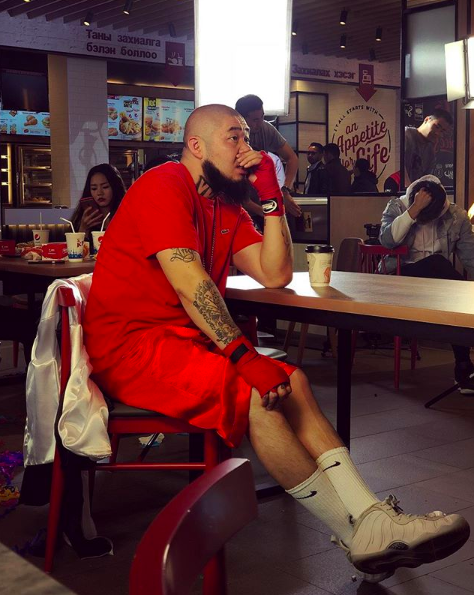 Perhaps nobody embodies Mongolia’s rise better than Big Gee, the country’s most famous rapper. Humble, thoughtful, and deeply proud of his country, Big Gee was born and raised in the Ger District of Ulaanbaatar, the poorest neighborhood in the city. But Gee (his name stands for ‘ger’) has since risen to a Jay-Z-level status. “When visitors come to Mongolia, they look towards horse racing, wrestling, our countryside,” Gee says, “but [they should] also look at the music, the art scene of Mongolia. That will give you the greatest sense of Mongolia.” Gee tells me this as he’s about to catch a train to Inner Mongolia to play a music festival. Summer music festivals are now big business in Mongolia, from the electronic festival Silence White Party to the two-day festival Playtime. And permanent live-music venues now abound in Ulaanbaatar, from rock bar Gandan Live House to the underground dive Basement. The nightclub scene has also exploded in Ulaanbaatar. “We all grew up listening to Eminem, 50 Cent, and Snoop,” says 29-year-old Sayan Dochinkhuu, who manages Ulaanbaatar’s hippest club, Zü Club. “We still play a lot of 80s and 90s hip-hop here. Mongolians still want to hear NWA, Ice Cube, and Dre.” Sayan wears shades (even though it’s nighttime) and speaks in rapid-fire bursts. He’s a whirlwind of positive energy, the epitome of this young, entrepreneurial, and urban Mongolian generation. Big Gee is gaining traction on Youtube and Instagram. Photo by @geemongolrapper. 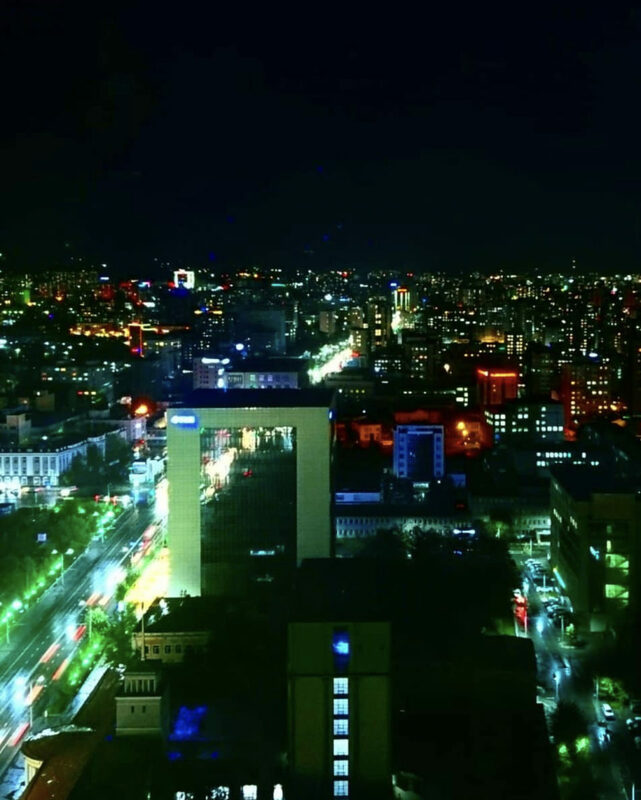 Ringed on all sides by mountains, concrete-clad Ulaanbaatar pulsates with energy. The streets rumble with Priuses (a trade agreement with Japan has bizarrely brought thousands of the eco-friendly cars to Ulaanbaatar). On the sidewalks and in Caffe Benne coffee-shops, teenagers sport the latest fashion, can recite the Golden State Warriors’ starting five on command. Drake blasts from passing taxis (also Priuses). A father I meet outside the Ulaanbaatar Train Station proudly shows me an iPhone video of his 12-year-old Mongolian son doing Backpack Kid’s ‘The Floss’ dance. And every July, the city swells as it hosts the Naadam Festival—a dazzling affair featuring horse racing, archery, and wrestling. To really understand Mongolia though, as any local will explain, you must also venture beyond Ulaanbaatar. Drive mere minutes outside the city, and you enter a way of life essentially unchanged for centuries. Nomadic herdsmen still live in gers (known to Americans as yurts). The great plains of the Mongolian Steppe stretch undisturbed in all directions. Wild Mongolian Takhi horses—outnumbering humans in Mongolia—roam freely. From the Altai Mountains to Lake Khövsgöl (“The Blue Pearl”) to the famous Gobi Desert, the quiet beauty of Mongolia’s countryside is exquisite. And it is out here that one truly understands the following fact: Mongolia, which averages two people per square kilometer, is the least densely populated country in the world. This distinction between fast-paced Ulaanbaatar and nomadic life on the Steppe is striking—and one that permeates deep into the Mongolian psyche. Many of Ulaanbaatar’s 20-somethings have parents and grandparents who still live nomadically. Many Ulaanbaatar residents were themselves born in gers, before leaving their families and moving to the city. It is a societal gulf of sorts—and that gulf is widening. From the Blue Sky Hotel Tower rooftop bar. Photo by @veganvacationist. A traditional Mongolian ger. Photo by @veganvacationist. The famous Chinggis Khan statue. Photo by @veganvacationist. With Mongolia’s recent economic rise has come an increased focus on tourism. President Battulga Khaltmaa declared 2018 a “Tourism Year” for Mongolia. “Our government’s vision is to have 500,000 tourists a year,” says Jambaldorj Tserendorj, the Mongolian Ambassador to Italy, as we chat together one evening at Riverside Golf Club, 45 minutes west of Ulaanbaatar’s center. “That number is ambitious, but it’s a very good goal.” The focus on tourism is working. 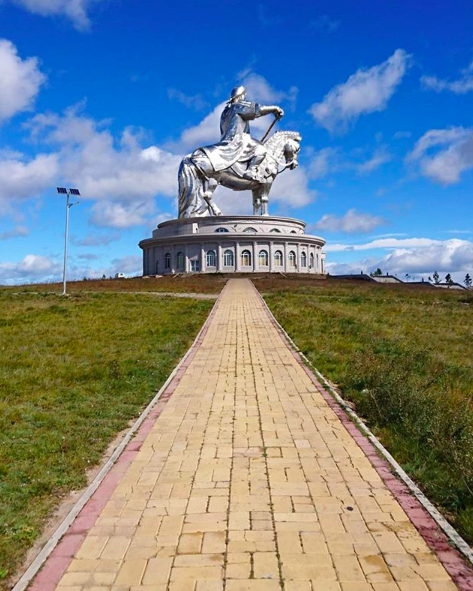 According to Ambassador Tserendorj, Mongolia, the “Land of the Eternal Blue Sky” is now on the radar of many Americans who have realized the relative ease of the trip over. There are many direct flights to Beijing, followed by a short two-hour flight to Ulaanbaatar. 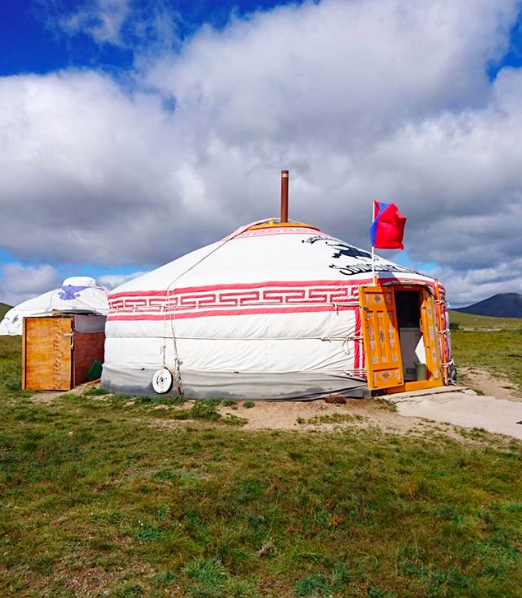 Another help is the recent burst of luxury accommodation springing up in Mongolia—from the epic Three Camel Lodge in the Gobi Desert (think Mongolian gers, Four Seasons-style) to the stately Terelj Hotel in Gorkhi-Terelj National Park to Ulaanbaatar’s Shangri-La Hotel. In 2018’s Mongolia, you still have the ability to fall off the grid, to get lost in the least densely populated country in the world, and also come back to creature comforts. This interplay of the modern and the traditional is precisely what makes a visit to Mongolia today so exciting. From having tea with nomadic herders in the Gobi Desert to clubbing in Ulaanbaatar, the past and present are alive and well in Mongolia—and ready to be sampled.